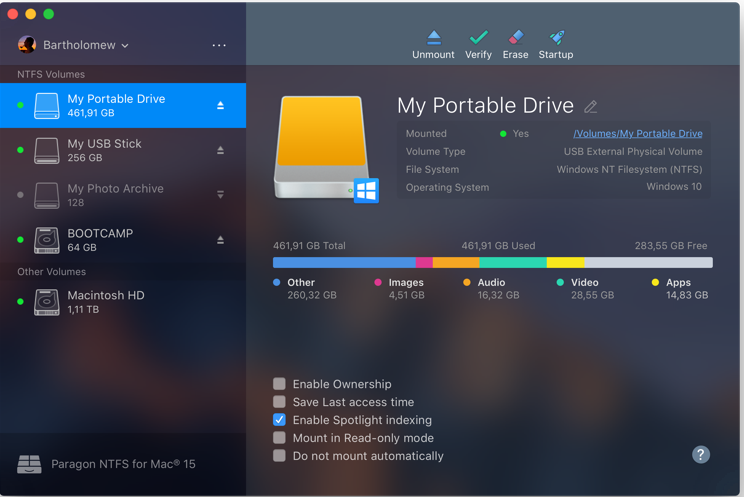 NTFS breaks down the barriers between Windows and macOS. Paragon NTFS effectively solves the communication problems between the Mac system and NTFS. Write, edit, copy, move, delete files on NTFS volumes from your Mac. Access all your NTFS drives and perform the most common volume operations like mount, unmount, and verify. Quickly restart your Mac in Windows from the menubar if it is installed on your mounted NTFS drive. Excellent solution for end users, SOHO, and enterprise, supports all NTFS versions from Windows NT 3.1 to Windows 8 (NTFS versions 1.2, 3.0, and 3.1), and mounts the NTFS volumes as native ones. Unprecedented high NTFS performance. The transfer rate is the same as with the native HFS file system. Familiar interface that is similar to Apple’s Disk Utility. Enable ownership and specify which users are allowed to access each newly-created file or folder, along with their read/write/execute privileges. Save last access time if you need macOS to recall every file you access on a selected volume. Enable spotlight indexing if you want instant Spotlight search, and if you want to view the detailed info about volume used space: how much space is occupied by applications, music, video, photos, etc. Mount in read-only if you need to access sensitive data without modifying any files. Do not mount automatically if you want to manually control access to a volume.